Our club received this thank you letter from No5 Charity recently. Well done to Kerry and all involved in raising the money this year. THE final fixture of the Hampshire League season is often the least well-attended of the five, with winners in each category having already been decided. Still, it is always worth turning up and trying to improve upon individual and team positions. Such was the attitude of the 24 Reading Roadrunners who made the trek to the Hampshire League race at Dibden Inclosure, in the New Forest. With the vet men already set to win their league, and the seniors sitting in joint fifth, the race was on, literally, for podium finishes all round. You just know things are getting serious when Mum and Dad Apsey come along to spectate. 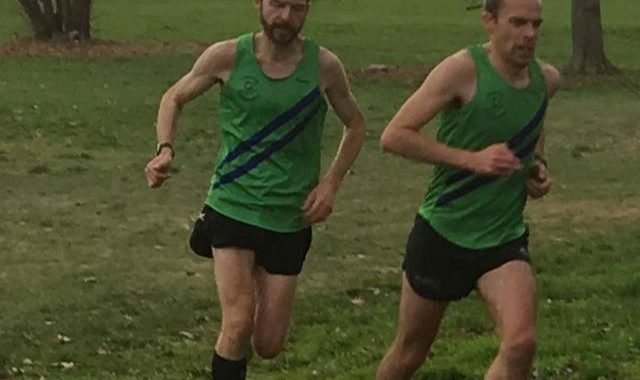 Club hero Rob Corney (right) looked incredibly comfortable on the first lap, and extended his lead during the second, to make club history by winning the race, beating Aldershot’s Philip Sewell, who is the individual league winner, by over 20 seconds. Jack Gregory was next to finish, in 11th place, and this propelled him into the top ten, for a ninth-place finish for the season overall. 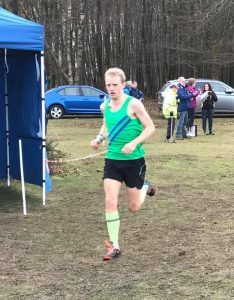 Third Roadrunner home was Ben Paviour, in tenth (second vet), followed by Mark Apsey, in 17th, which was enough to improve his individual position from tenth to seventh overall. It’s hard to believe the club could have a team where someone of Mark Worringham’s calibre is fifth home, but such is the impressive depth of the squad at the moment. Mark completed the scoring team in 24th (third vet). The Wednesday evening training group that these guys are organising for themselves is obviously doing the trick. 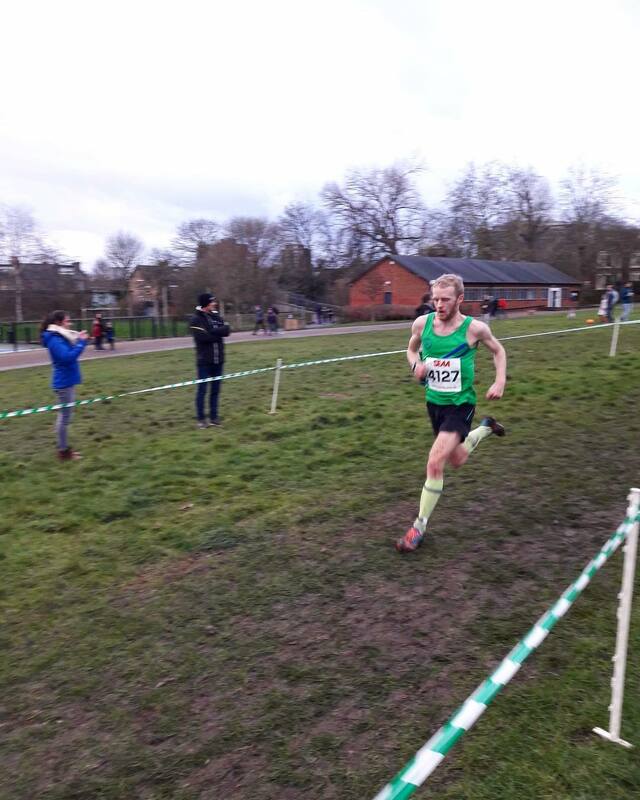 And despite feeling like he had run badly all season (it’s all relative), this secured Mark’s position at the top of the vet men’s leaderboard, with Ben Paviour not having run enough of the races this year to qualify (you have to run four of five). The senior men’s team was second, which gave them an end-of-season position of third – mission accomplished! Next across the line was Chris Lucas, in 31st, followed by Lance Nortcliff, in 36th (sixth vet), having had his run interrupted by the appearance of some New Forest ponies on the course. This vet placing was enough to give Lance a second-place finish overall, and the vet men’s team retained their title. Great work! 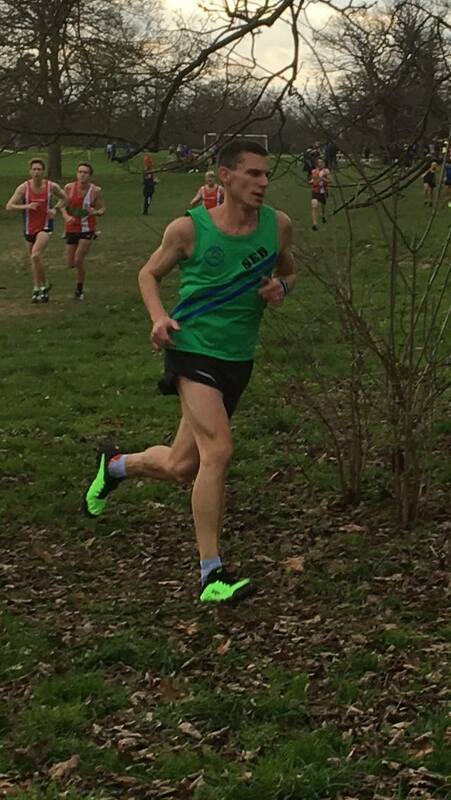 The course having been listed as unsuitable for spikes led Andy Mutton to have an interesting run in road shoes. In fact, the course was OK for short spikes. 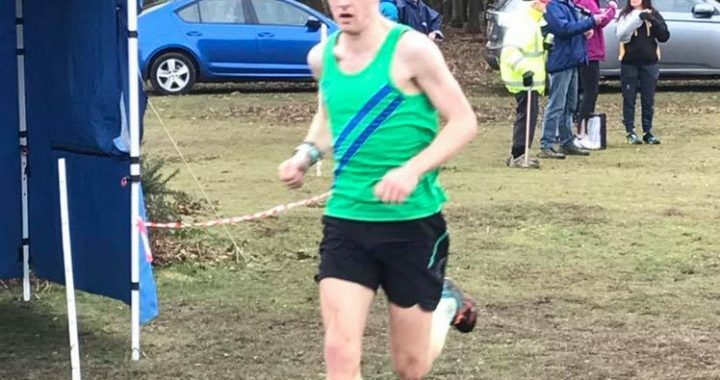 Ashley Middlewick was next, with a parkrun already in his legs, followed by Chris Burt, making his debut in the league, but looking forward to next season. Brian Kirsopp was unable to catch Chris this time, but can celebrate being third MV50 nonetheless. 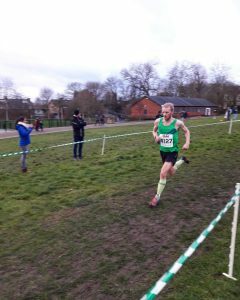 Andrew Smith, on his way back from injury, was next, with Chris ‘I hate XC’ Buley, in 100th place, out of 194 runners. 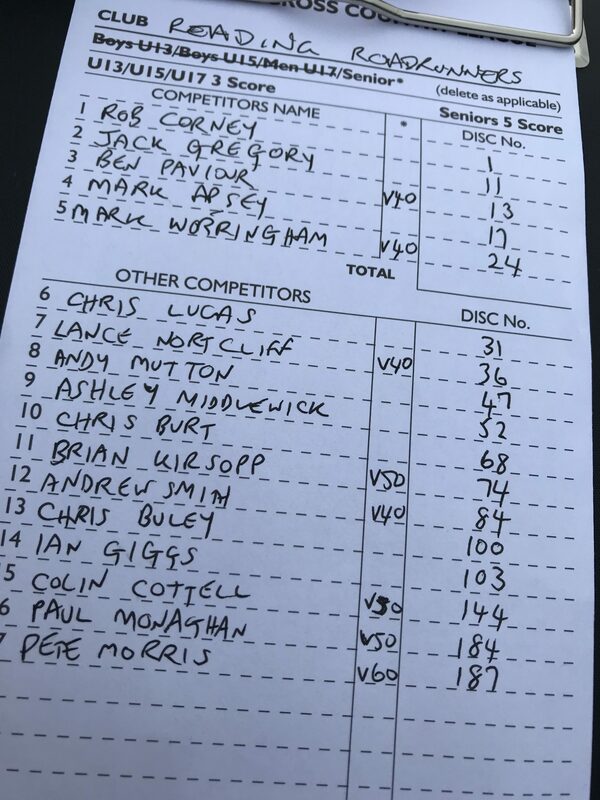 Another parkrunner, Ian Giggs, followed, with Colin Cottell, and the last two park-runners, Hampshire League newbie, Paul Monaghan, and Pete Morris, completing the men’s team. You have to wonder what kind of runs people could have without a parkrun beforehand? Pete Jewell unfortunately pulled up with a hamstring injury on the first lap, and did not finish. 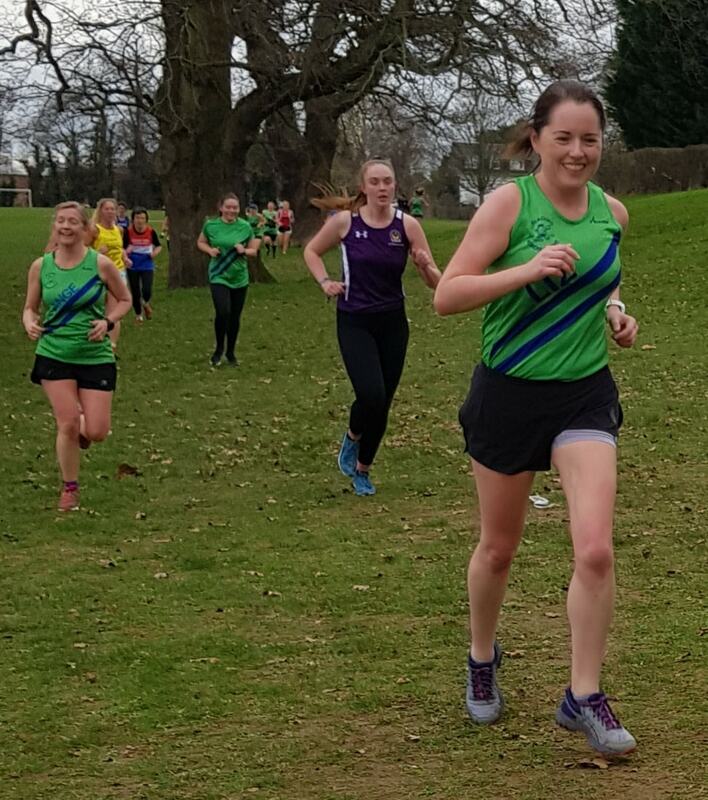 The women’s team has been plagued by injury this year, and you have to feel for Gemma Buley, whose new coaching has taken her from strength to strength, as she doesn’t always have a strong team to back her up. 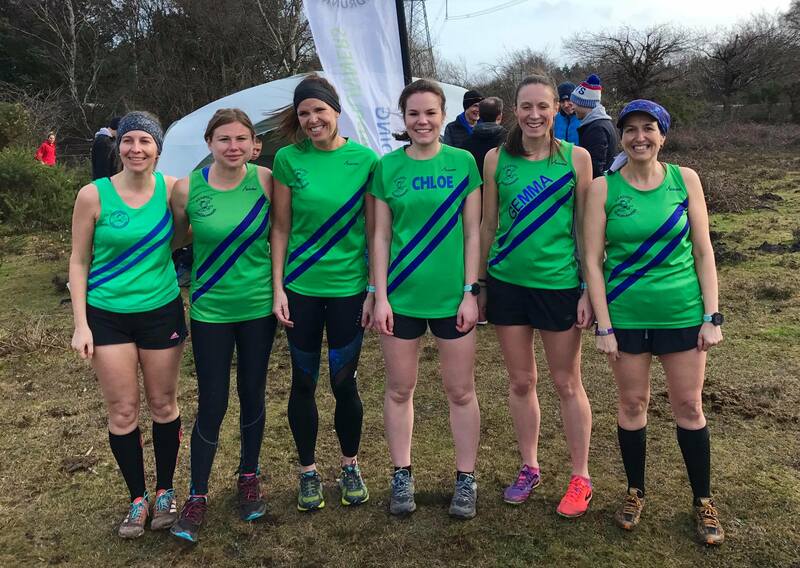 Still, we did manage to get a team out for every race this season, and a number of women have tried this league for the first time, so this is progress. Saturday’s fixture saw Gemma (right) finish 12th, her best position yet, and this gave her an overall tenth place on the season’s leaderboard. Well done, Gemma! She then had time to refuel, and put some layers on, before returning out to the course and cheer on every single one of us on her cool-down. As we were missing some of our stronger runners, with Chantal Percival, Bithja Jones, Helen Pool and Nicole Rickett nursing injuries and niggles back to full health, and a jet-lagged Sarah Dooley having other commitments, our next runners to finish, vets Caroline Jackson and Claire Raynor, came in 69th and 70th. 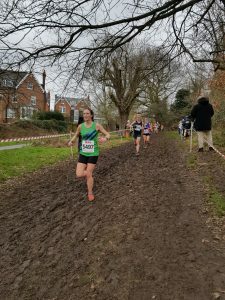 Caroline has done very little in the way of XC before, preferring to run one marathon after another, but found that she enjoyed this short race, and said: “If all XC was like that, I would do more.” Breaking news, Caroline… all XC is like that, and it may even help with training for the longer distances. 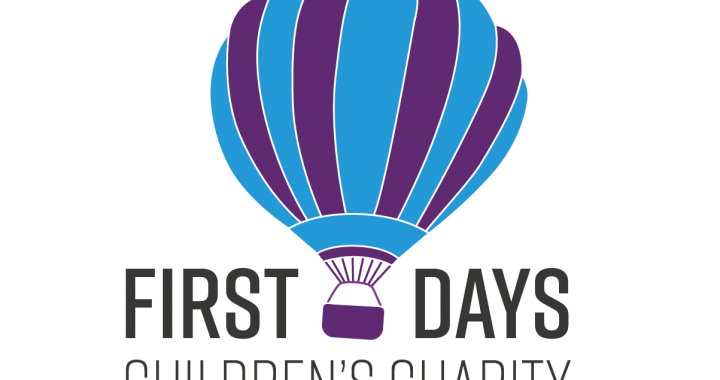 Claire Raynor is a new member, and another one of us who has been bringing Reading AC children to these events for years. In my spare club T-shirt, Claire had a great race, in spite of her worry that she might be last, picking people off from start to finish, showing that her training for the Manchester Marathon is going well. 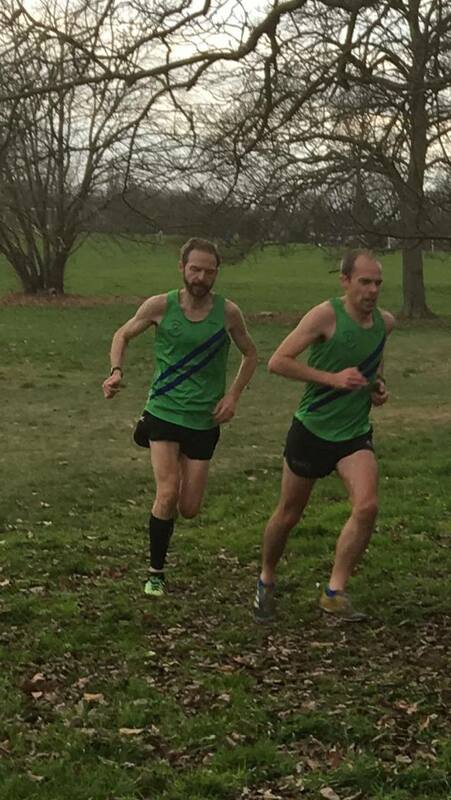 Despite both these two having run parkrun in the morning, I was still unable to catch them, and they completed the senior women’s scoring team, which finished 12th on the day, and eighth overall for the season. I was the third vet scorer for the team, in 77th, and the vets team finished in ninth, and sixth overall. Chloe Lloyd was back for more after her debut at Prospect Park, and this time she meant business, and had ditched the leggings for shorts. Chloe came in in 91st, closely followed by Claire Seymour, in 94th, out of 146 runners. Claire is the only one of our women to have run every fixture this year. Cecilia Csemiczky didn’t make the journey this time, recovering from a chest infection, but we must thank Cecilia for her participation and support throughout the season. I am also grateful to Phil Reay for coming along to record the numbers for us this time, and maybe next year we will see him back at full fitness and running in the league. This turn-out and set of results was a fantastic end to a great season in the Hampshire League. It would be brilliant to see even more runners join us next year. The fixtures are generally on the first or second Saturday of the month, and run from October to February, so pencil in those dates! I’m off to treat myself to some new spikes. 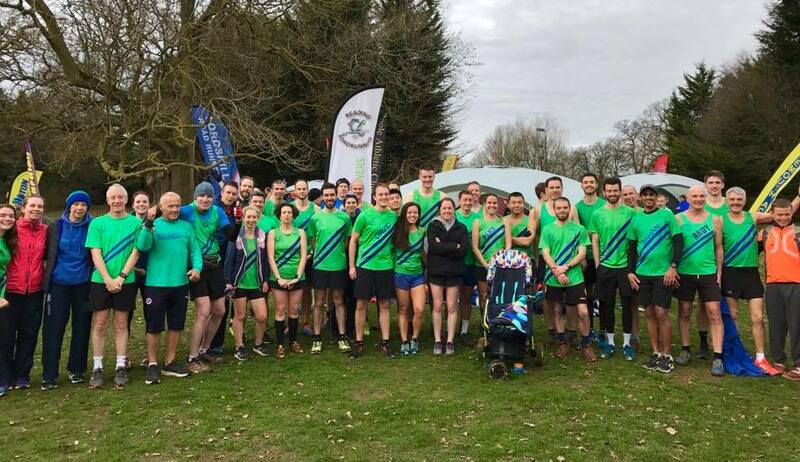 Following the cancellation of the final Thames Valley Cross Country League fixture of the season, due to be staged by the Bracknell Forest club at Lightwater, Roadrunners have been confirmed as runners-up in the overall league positions. Ladies’ final places: 1 Datchet 11pts, 2 Windle Valley 14pts, 3= Roadrunners and Maidenhead 20pts. Men’s final places: 1 Datchet 6pts, 2 Roadrunners 20pts, 3= Bracknell and Windle Valley 20pts. 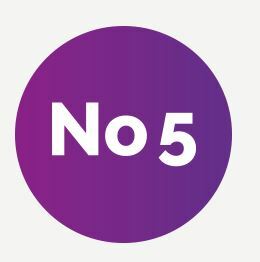 Overall: 1 Datchet 6pts, 2 Roadrunners 13pts, 3 Windle Valley 15pts. 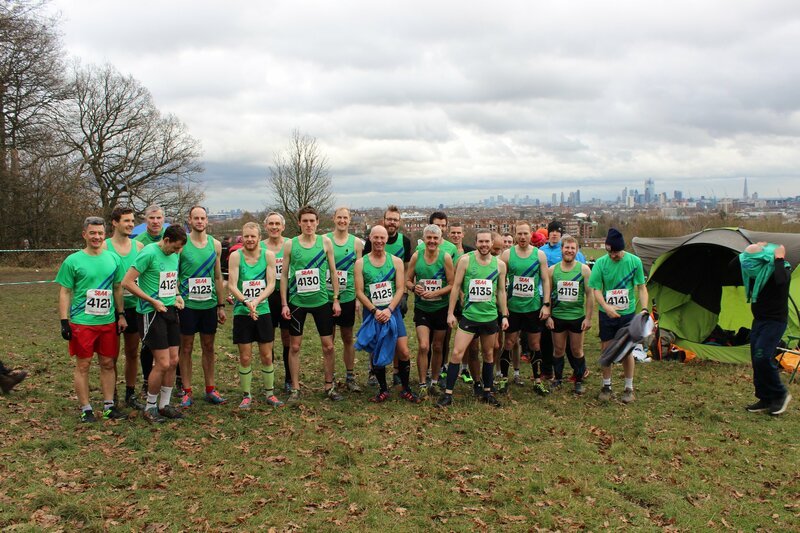 A WHOPPING team of 35 Reading Roadrunners travelled to Hampstead Heath, London, for the South of England AA Cross Country Championships. Many had heard so much about this event, with its epic uphill start, that they just had to come and see for themselves. The majority of us travelled by team coach, but our youngest runners were among those who made the journey independently. As we made our way across the site to set up our base, we were just in time to catch a glimpse of our Under 17 runner, James Rennie, doing battle over the 6k course. It is not easy being the only runner for a club, so our unexpected cheers were welcome. James (right) went on to finish 76th out of 230 – an excellent result. Next up was Under 20 Katie Rennie, James’s sister. 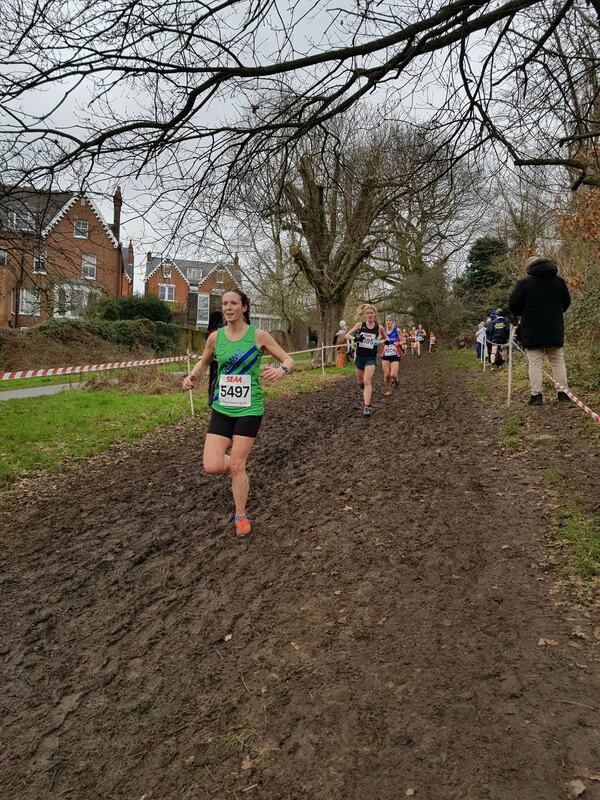 Having competed in the Hampshire League this season, Katie is well used to being part of the senior women’s races. In this championship, however, she was required to race separately, in what turned out to be an incredibly small field of only 69 young women. Despite carrying a recent injury, Katie (left) had a strong race and was determined not to be last, which she wasn’t. No doubt she will feel much more at home with the senior women next time. Well done, Katie! Ten of us made up the senior women’s team, a mixture of regulars and newcomers, with some a little anxious about what lay ahead. 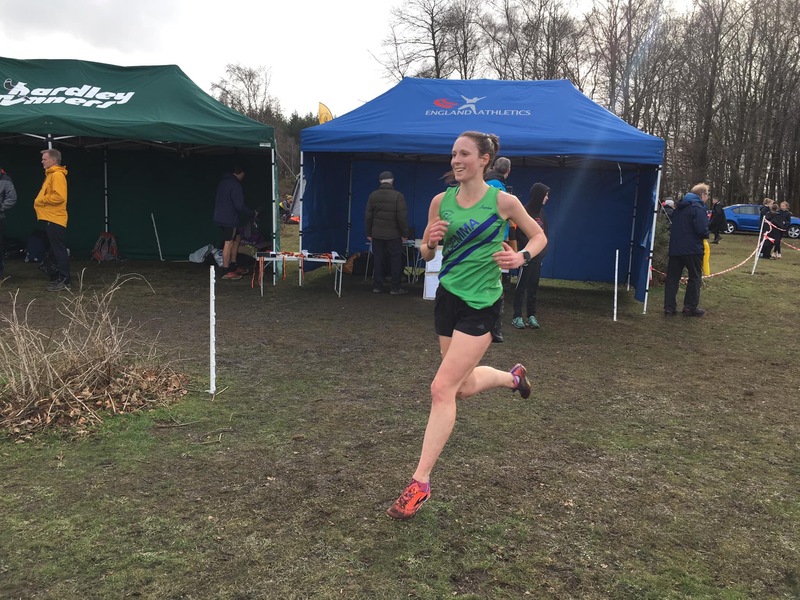 We all expected Gemma Buley to be first back, but I could tell that she was having an exceptional race when I saw her on a part of the course where the front runners loop back; in four years of running this course, I have never seen a club member on this part of the route. Gemma (right) was delighted with 86th place, and a time seven minutes faster than over the same course at the Nationals last year. What an achievement! Next in were Sarah Dooley (243rd), Marie-Louise Kertzman (394th) and Sarah Alsford (402nd), making up the scoring team. 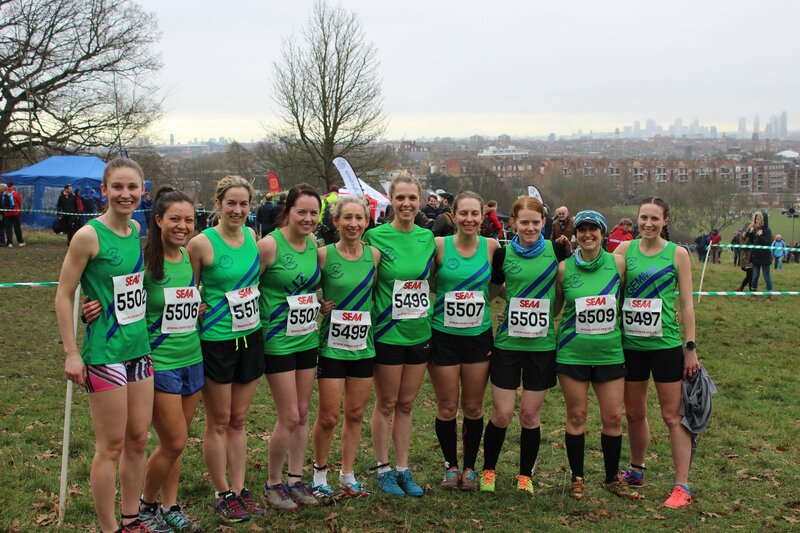 The women’s team was 39th out of 71 complete teams – not bad at all. Pip White and Nicole Rickett finished within seconds of each other, and were followed by Liz Johnson, Beth Rudd, myself and Claire Seymour, with the entire women’s team home within 45 minutes. Claire and I were particularly chuffed that, for the first time, we didn’t miss the start of the men’s race… result! From the post-race chatter it was evident that every one of us had enjoyed the race, and there was even talk of investing in spikes for next season. The men’s race prides itself on being the only XC championship race still run over the 15k distance. This fact, and its 90 minute cut-off, doesn’t seem to deter people from entering, and well over 1000 men lined up at the start. First RR back was, of course, Rob Corney (left), in an incredible 36th place. Rob had hoped to improve upon his 78th place from last year’s Nationals, and he certainly did that. He didn’t find it easy though, and I must admit that the face I saw on the finishing straight was not the one I usually see as Rob cruises around local races; there was real effort here – well done, Rob! 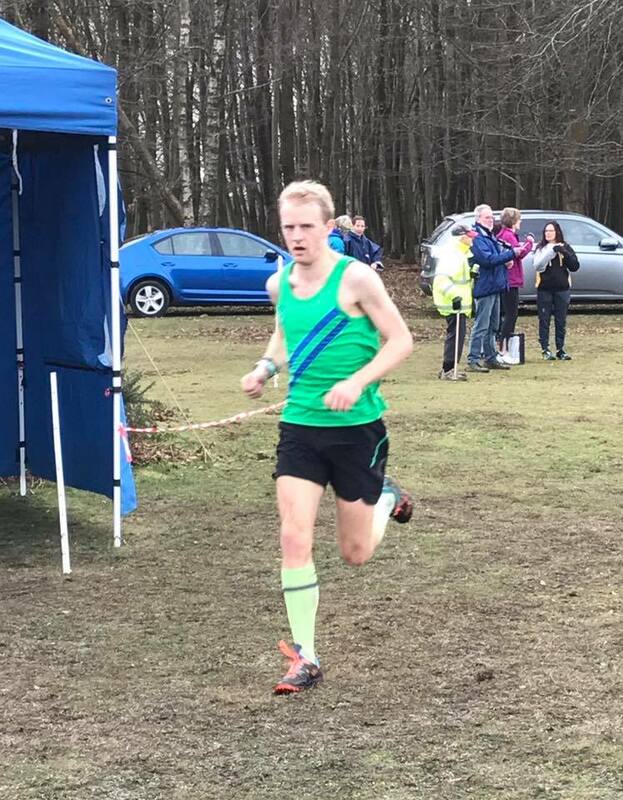 Next in was Jack Gregory, making the top 100 in 96th, followed by Seb Briggs (170th), Chris Lucas (239th), David McCoy (the younger) in 245th, and Lance Nortcliff (361st). Initial team results were incorrect, as an administrative error meant that some of our men were listed as ‘Reading Road Runners’ and some as ‘Reading RR’, and as such were not all counted as members of the same squad. When corrected our men were promoted from 23rd place to 22nd, out of 69 complete teams. Andy Mutton and Grant ‘no parkrun in these legs’ Hopkins were next, finishing within the hour, with Chris Burt, Brian ‘not a thing left to give’ Kirsopp, Chris Buley, Calum ‘poker face’ Baugh, Robin Lomax, Brooke Johnson, Gary Tuttle, Ian Giggs, Mark Andrew, Bill Watson, David Caswell, Alan Freer, and the Peters – Reilly, Morris and Higgs – completing the team. Pete Morris impressed the younger members of the team, as a vet 60 with seemingly endless levels of energy and passion for running. Peter Higgs finished the race pain-free, but sadly also free of course markings, as it was all dismantled around him. Still, he gave it his all. Pictures: Peter Reilly and Pete Morris. 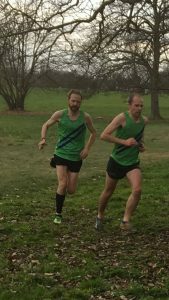 WHEN I first joined Reading Roadrunners in 2015, all I heard was that the Sunday Thames Valley Cross Country is the league to do; that Saturday one is really competitive, only for the fast people. 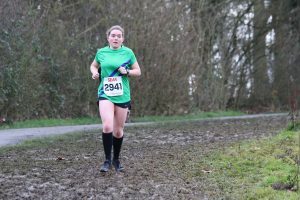 Having been inspired to join a club, however, by my time watching my daughters run XC in that very league, I was not deterred, and, despite not being a fast runner, I have never felt unwelcome. We’re always excited, therefore, when the Hampshire League fixture is the most local one, which Reading AC host in Prospect Park, because it provides an ideal opportunity for our club members to try the league for themselves. 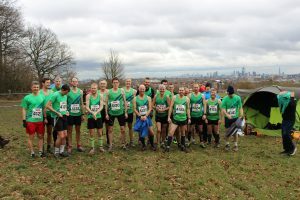 And such has been the buzz around all XC fixtures this year, that we were overwhelmed by the number of Reading Roadrunners who wanted to come along. Some were donning their green vest for the first time. 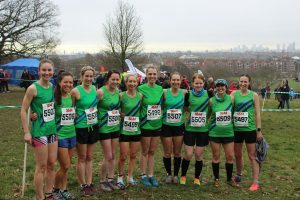 Others were completely new to XC, and weren’t sure what to expect, so the usual advice was issued: the front end of the race will be incredibly fast, your mile/km splits will mean nothing, and try and catch the person in front. We can always rely on Rob Corney to try to do just that, a new streamlined haircut helping him to lead the senior team home. 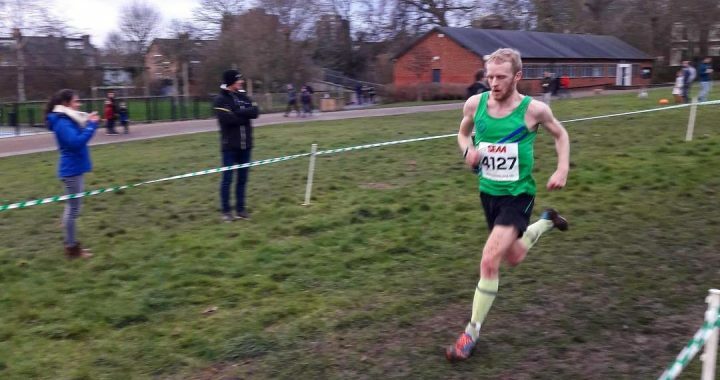 Despite nursing a rest-day-induced (his claim) niggle, Rob had a storming race and was third overall, only seconds behind two Aldershot runners, and an improvement on his fourth place here last year. Rob was followed in by Jack Gregory, with a really good run, in an excellent 12th, his best position so far. With this being the fourth fixture of five, the biggest hope for silverware this season lies once again with the vet men, currently sitting at the top of the league. And they did not disappoint. You know you have a strong vets team when the likes of runners like Lance Nortcliff and Andrew Smith are superfluous to the scorers. The scoring this time was well taken care of by a tightly-packed Ben Paviour (20th), Mark Worringham (22nd) and Seb Briggs (26th), as second, third and fourth vets. 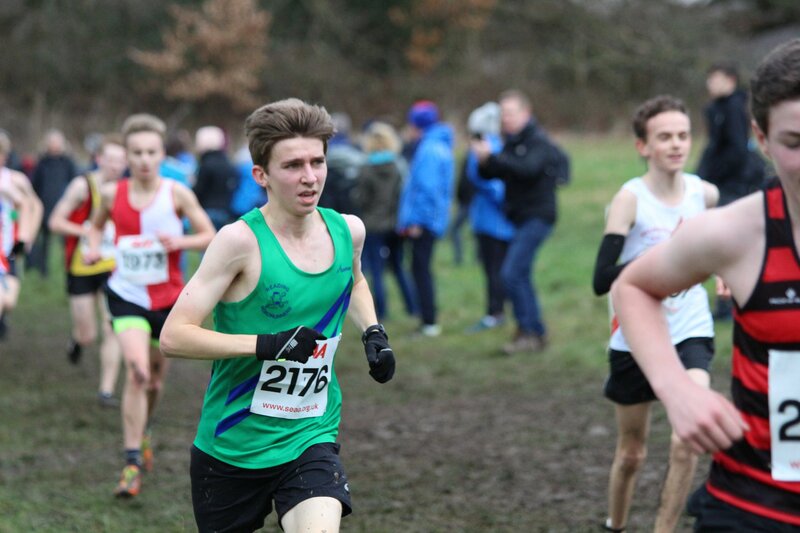 Seb’s sprint finish battle with an Under 20 runner from Aldershot was a real highlight, but the younger legs won out in the end. These first five finishers put the senior men’s team in second place, and joint fifth on aggregate, while the vet men were again first, and remain at the top of the table. Although the scoring was completed by these five, the job of the rest of the team — as there were 31 more men! — was to keep on pushing and keep the scores of the other teams down. 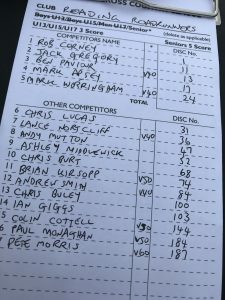 David McCoy (the younger), was next, with Lance, Ashley Middlewick (nicely warmed up from his cycle from Frimley Lodge parkrun), Andrew, Pete Jewell, Brian Kirsopp, Matt Davies and Calum Pratt all managing top-100 positions. Pete and Brian were also among the top 10 for the M50 age category. Standing at the finish line, it was clear that every single person had run their absolute hardest, and the efforts of all were appreciated. I’d have liked prior knowledge that David Clay always finishes his races a little unsteady on his feet — gave me quite a worry there, David — with his competitive spirit leading him to try to chase down a Reading AC runner. As usual the women’s race, earlier in the afternoon, was less well attended, and for some reason was the smallest women’s field of the season so far. Nevertheless, our club was out in force, with 19 of us making up a significant proportion of the competitors. Leading the senior women home was Gemma Buley, in an excellent 18th place, new coaching obviously paying off. She was followed by Hampshire League debutante Sarah McDade, and our first vet scorer, Helen Pool. These three women placed the senior women in sixth, and seventh on aggregate, a really pleasing result, especially since we were missing two of our strongest performers, Chantal Percival and Bithja Jones, due to injury. As I was obviously still running, I didn’t see our second vet, Sarah Dooley, and XC newcomer Katherine Foley cross the line, but they were both awarded the same time, so no doubt there was some friendly rivalry there. 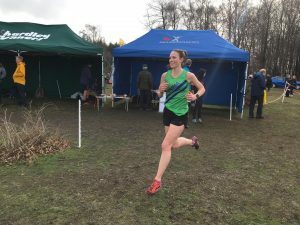 They were followed by Liz Johnson, delighted to be making the scoring vet team on her XC debut, despite her pre-race fear that she would be rubbish (not her exact words). The vet women’s team was fifth, and is also fifth on aggregate. These senior and vet results were our best of the season so far. There were some stand-out performances, with Angela Burley, Katie Rennie, Sarah Harford and Claire Seymour all making the top 100, and Alice Carpenter, Beth Rudd, Chloe Lloyd, Tina Woffington, Divya Samani and Ruby Lee all new faces in this league, alongside the experienced Hampshire League runners Maureen Sweeney and Cecelia Csemiczky. Tina reported that she had loved it, and Ruby thanked those who had offered her support and encouragement. Cecilia was just a little disappointed that she hadn’t managed to beat her nemesis, Marilyn from Victory. All in all, a fantastic set of results from both men’s and women’s teams, and the camaraderie on the day was exceptional. The next and final fixture of the season will be at Dibden Inclosure in the New Forest, on Saturday, February 9th. All members welcome; let’s try to finish on a high. Note: You do have to be a fully paid-up member, and wear a club vest/T-shirt.